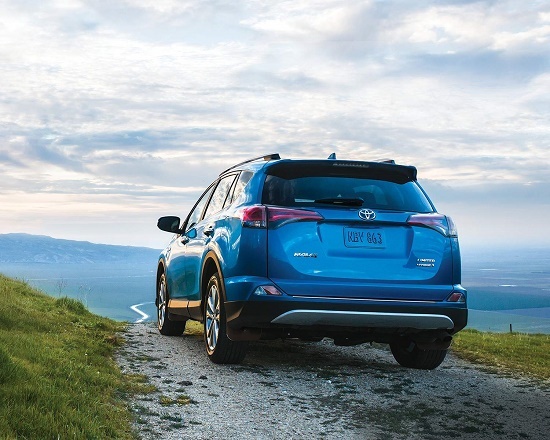 Ergonomic CabinExperience life in the fully equipped and athletic 2017 Toyota RAV4 Hybrid. Featuring an alluring four-door design with enhanced seating for five, you will be fully prepared for your next adventure. Available trim levels include the LE+, SE and the Limited. Immense attention to detail is evident in each aspect of the interior design on the 2017 Toyota RAV4 Hybrid. Sit back in an ergonomic dreamland where each amenity has been placed with calculated intention to provide an environment that is designed with you in mind. Smooth sophistication is brought forward through the available chrome inner door handles and 8-way power adjustable driver’s seat as you drive with superior comfort and lasting support. Refinement is found in theoptional SoftTex seating surfaces with heated front seats to help combat chilly days and early mornings. With the flexibility of the dual zone automatic climate control system, you can set and maintain two differing front temperatures so that everyone can enjoy climate satisfaction. Keep your hands on the wheel with ease as you benefit from the available 3-spoke leather-wrapped and heated steering wheel with mounted audio, Bluetooth, and voice recognition controls. Arrive with dominance in the 2017 Toyota RAV4 Hybrid as you take pleasure in a well-thought out exterior design that speaks of the power held within. Bold body contours and aggressive aerodynamics enhance efficiency as the LED headlamps; LED daytime running lights, fog lamps and LED rear taillamps to brighten up each environment you occupy. 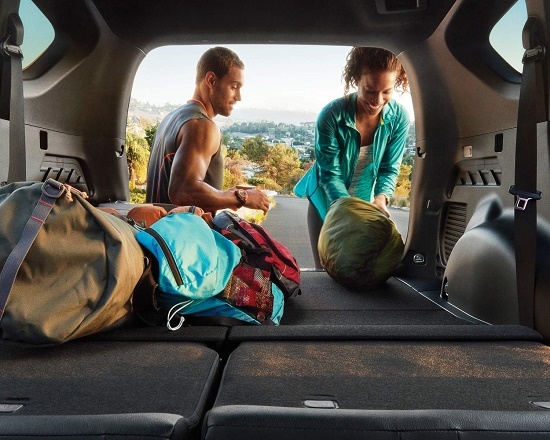 Convenience is provided through the hands-free power rear liftgate as you load and unload your cargo with ease. 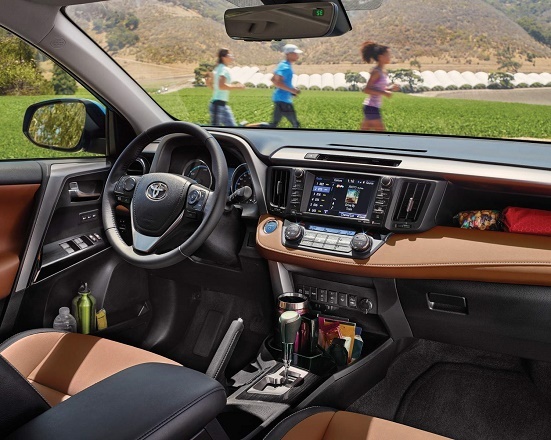 As you make your way to each destination in the 2017 Toyota RAV4 Hybrid, you can do so with advanced connectivity and an array of entertainment options. Featuring the available 7-inch Display Audio System, you are given access to your compatible devices through Bluetooth capability and voice recognition. Making calls and take messages with the help of this hands-free technology so that you never have to compromise your safety to stay in touch. Entertainment is offered throughthe available SiriusXM Satellite Radio system with over 120 channels of commercial-free listening to help liven up any journey. 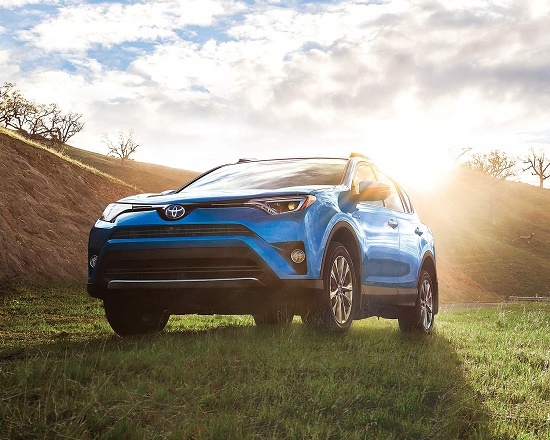 Expand your experience in the 2017 Toyota RAV4 Hybrid as you equip your vehicle to meet personal needs and preferences through available Toyota Parts and Accessories. Through the available interior lighting kit, you are have illuminated footwell areas for advanced sophistication. Elevate your aesthetics through the addition of body side moulding as you experience protection from dings and bumps. Bring along more than you ever thought possible with the available towing hitch ball as you let your dreams run wild. You are in for more than expected when you drive the relentlessly capable 2017 Toyota RAV4 Hybrid. Enjoy the highly advanced Hybrid Synergy Drive System as you experience a seamless switch between the gas engine and electric battery power for efficient and refined performance. Advanced engineering delivers regenerative braking, which captures energy from applied brake pressure and utilizes it to charge the electric battery. Drive with power, economy and control with the Continuously Variable Transmission and Drive Mode Select to tackle a variety of terrain with ease. Get the most out of driving behind the wheel of a new 2017 Toyota RAV4 Hybrid! With the enhanced power and efficiency you need to explore with unsurpassed freedom; it is the perfect SUV for everyone with a busy lifestyles, including families. Check out the 2017 Toyota RAV4 Hybrid at your local Edmonton Toyota Dealer – Gateway Toyota as we take care of all of the details. We have the best selection of new 2017 Toyota models including the 2017 RAV4 Hybrid! Book your test drive with Gateway Toyota today.